Does Not Contain: MSG, Acesulfame-K, Artificial Flavors, Artificial Sweeteners, Artificial Colors, Aspartame, Sucralose. 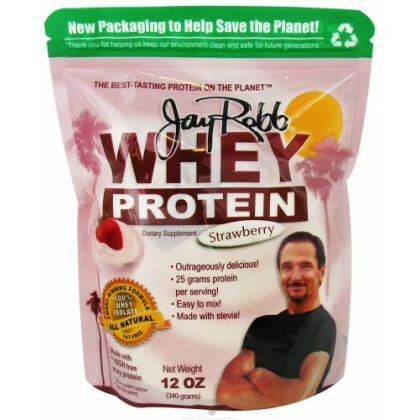 Offering Only The Best!Since 1990, the Jay Robb Corporation has been producing what we feel are the best protein powders on the planet. To the best of our knowledge, we were the first company in the world to create a whey protein powder made from cows not treated with rBGH (a synthetic growth hormone). Because rBGH-free whey is primarily obtained from small farms throughout the world, there is only a limited supply. The Jay Robb Corporation secures large quantities abroad each year to meet our growing needs; however, there are times when the world supply runs short. During these periods, we may choose to procure the highest quality domestic whey protein in conjunction with rBGH-free raw materials to produce our world-class whey protein. God bless you! Jay RobbClinical NutritionistAuthor of The Fruit Flush Our Mission Statement: To produce the best-tasting protein powders on the planet.